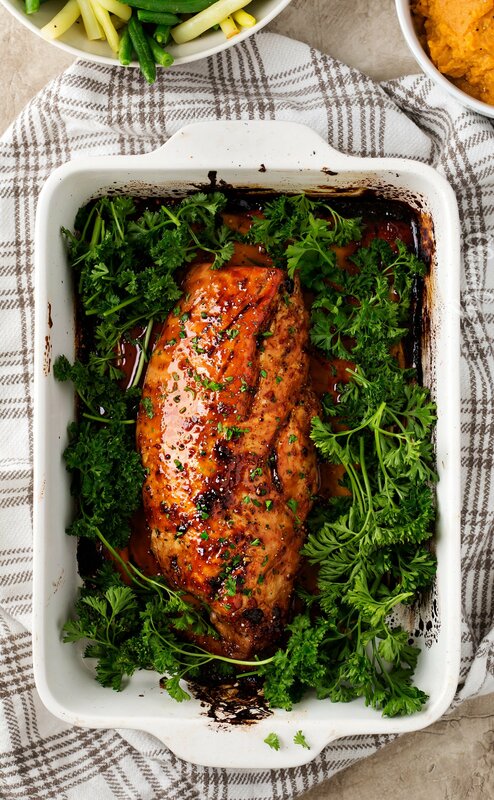 This roasted pork tenderloin is ready in a flash, and absolutely packed with great ginger, honey and garlic flavors! It’s a weeknight winner! Stuck in a weeknight dinner rut? 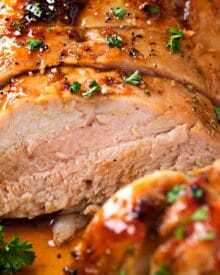 Try this oven roasted pork tenderloin that’s marinated, seared, roasted and basted with plenty of the extra marinade for maximum flavor! The best part? It’s ready in less than 30 minutes!! Are you all ready for a great less than 30 minute meal? With school back in session, I am SO not in the mood for long, involved meals. Even basic beef tacos had me dreading dinner time the other night. My energy level is just. not. there! Anyone else feeling this way lately? 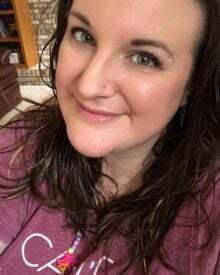 When I plan out my meals for the week, I always ask for input from my husband and daughter (my son doesn’t get a vote since he literally lives on chicken nuggets, ketchup and pasta lol), and a lot of the time I get a, “I don’t care what the meal is, but just NO chicken!”. We eat a LOT of chicken in this house you guys… and apparently, some family members are so over it. I figured that I needed to choose something quick, easy, and healthy, so I went with a pork tenderloin! Alright, confession time… before I created and tested this recipe, I had never cooked a pork tenderloin before. I know… crazy right?! Somehow I always thought it would be fussy or complicated, but in reality, it’s exactly the opposite! IS THIS MEAL REALLY READY IN UNDER 30 MINUTES? Yes indeed! Well, marinade time not included. But just toss the pork in the marinade in the morning, and you’ll be ready to go at dinner time! The beauty of a pork tenderloin is that it’s pretty quick-cooking. Plus, you don’t want to overcook the meat, so it doesn’t have to cook as long as you’d think. BUT… YOUR PORK IS KIND OF PINK! It sure is, which is what makes it so tender and delicious! Pork is actually supposed to be cooked to an internal temperature of 140-145 degrees F and have a blush of pink. I pull my tenderloin from the oven before then, so it can broil and get that great glaze on top without going over the temperature and losing that great blush of pink! 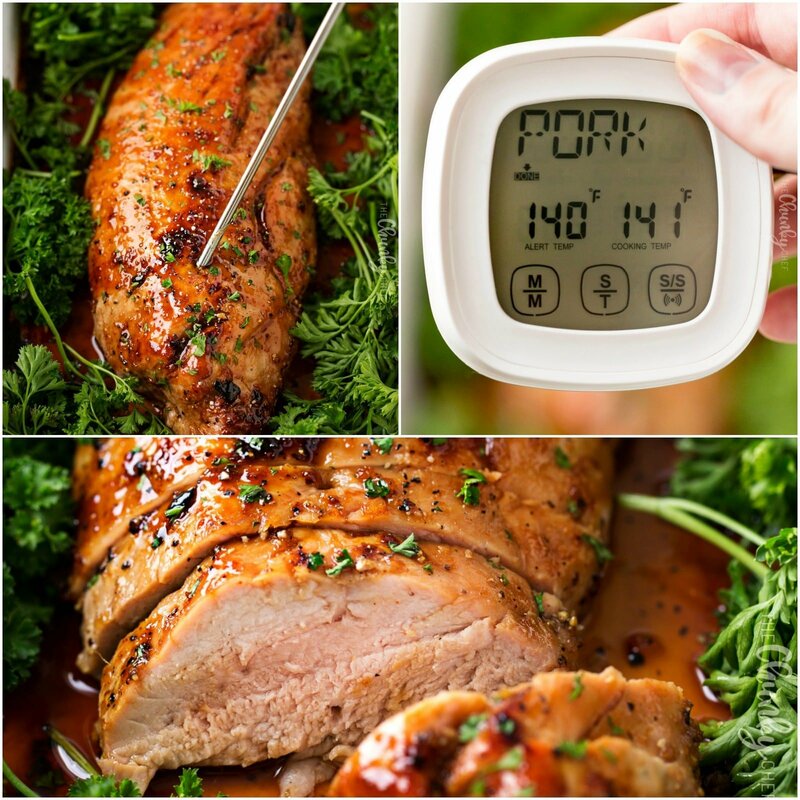 I love to use my handy meat thermometer for this, because I can leave the probe IN the meat while it’s in the oven, and the device sits on my counter. I can program it to beep when it’s at a certain temperature, so I don’t have to continually check and re-check. IS THIS PORK SWEET OR SPICY? It’s really a perfect blend of sweet and savory, and the spiciness is up to you! 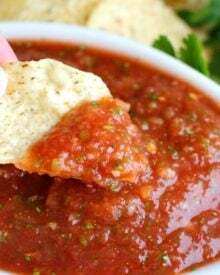 I add a pinch of cayenne to my marinade, but you can leave that out if you don’t like a little spice, or increase the amount to give it a healthy kick! The great thing about pork is that it’s really a blank canvas, (like chicken), in that it takes on the flavors that you give it, so you can truly make this dish your own. WHAT DO I SERVE WITH THIS ROASTED PORK TENDERLOIN? Since it’s almost Fall, I went with a mashed sweet potato and some steamed green and wax beans. BUT, here are some other delicious options! 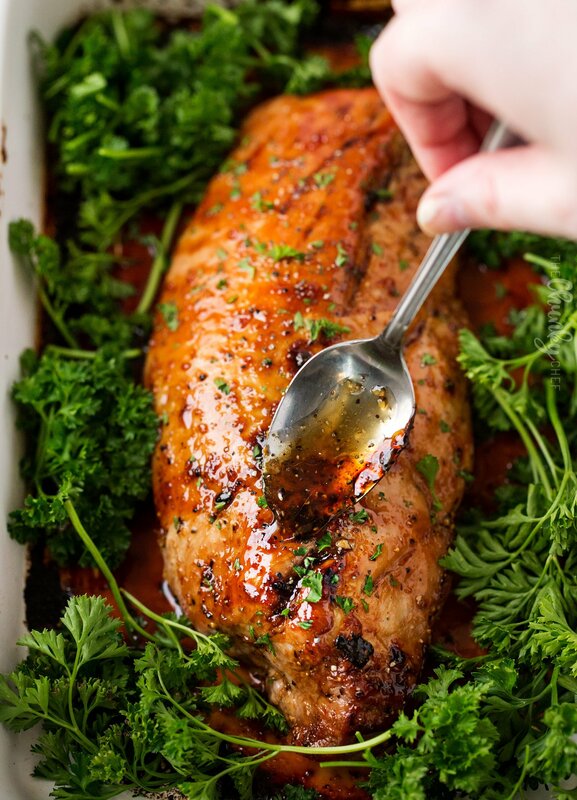 I really hope you guys give this ginger honey roasted pork tenderloin a try… I promise, it’s not complicated, and it comes together SO quickly! 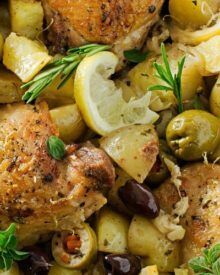 Give it a try instead of opting for chicken (again), and I’m sure you’ll love it! LOOKING FOR MORE GREAT PORK RECIPES? 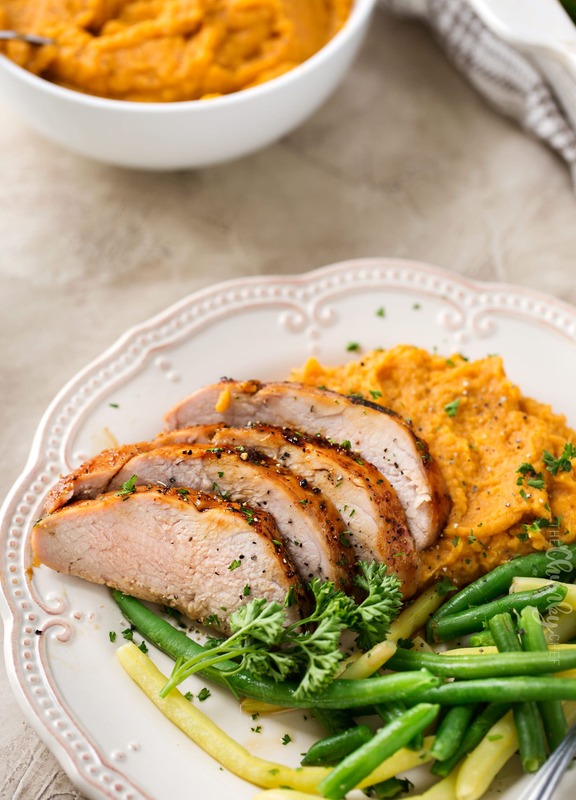 This roasted pork tenderloin is ready in a flash, and absolutely packed with great ginger, honey and garlic flavors! It's a weeknight winner! Combine ginger, honey, lemon juice, garlic, soy sauce, cayenne, salt and pepper in a small mixing bowl. Add half the marinade ingredients to a large ziplock bag and add pork tenderloin. Seal bag and marinate for a few hours or overnight. Pour leftover marinade into an airtight container and keep refrigerated until ready to roast the pork. Line a baking sheet or baking dish with a double layer of aluminum foil and set aside. Remove leftover marinade container from the refrigerator and preheat oven to 400 F degrees. Heat a large skillet with a bit of olive oil over MED-HIGH heat, remove excess marinade and sear pork tenderloin very briefly on all sides until lightly golden brown. Transfer tenderloin to prepared baking sheet/dish and roast for 10-15 minutes, until a meat thermometer inserted in the thickest part of the tenderloin registers 133 F degrees. Brush with leftover marinade and broil on HIGH for 1-2 minutes until golden. Remove from oven, cover with foil and let rest a few minutes. Pork will continue carry-over cooking and should end up between 140-145 F degrees with a blush of pink. Brush marinade over the top of pork tenderloin and sprinkle with parsley if desired. Slice into 1/2 inch thick slices and serve. Prep time does not include marinating time, as this will vary from individual to individual. I made this recipe for Easter and it was absolutely delicious. 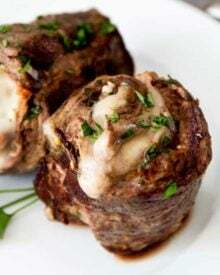 I made as directed only adding onion flakes and Italian seasoning and had to substitute raw garlic with garlic powder, my family and I thoroughly enjoyed this and I will definitely be making this again. 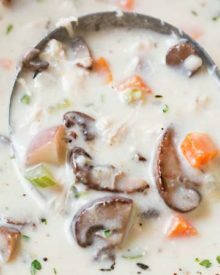 This was so easy to make that I cannot believe how delicious it was! I used all the marinade and used a cast iron pan which I deglazed and made the remaining marinade into a sauce. Will definitely make this one again! Made this recipe tonight. Loved the result. My boyfriend loved the dinner I made!! I also made the Cheesey Brussel Sprouts with bacon. Best brussel sprouts I’ve ever had!!!! 5 stars to both recipes! I will be back to Chunky Chef for more!!!!! This was delicious! Will definitely be a keeper. Just made it for dinner and I was easy and delicious. I don’t have a meat thermometer (getting one this week) so I added a few minutes at the end. So good! Really, really good. I used 1 T. lemon and 1T. rice wine vinegar. All else exactly to the recipe, except did not need the last step broil. 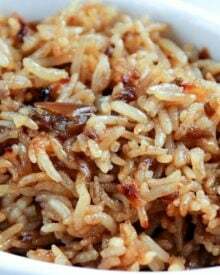 I served it over plain white rice with the leftover sauce heated with the pan drippings. My husband says it is one of the best things he has ever tasted. my only comment and concern is that the recipe calls for the pork marinade to be brushed on the finished pork . is there not a salmonella concern? It would be, except in step 2 the recipe instructs you to only use HALF of the marinade for the pork, and to keep the other half in an airtight container. The half that hasn’t touched the pork is what you brush on the pork after cooking. I tried this recipe and it was easy to make and meat was tender and juicy. The only thing was we are not big on hot food so I omitted the hot pepper. Other than that it was great! Excellent! 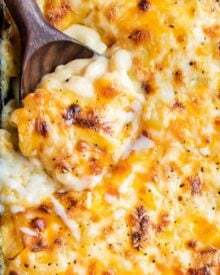 Served for Christmas dinner with your Garlic Parmesan Cheesy Scalloped Potatoes. I had 2 tenderloins weighing almost 1 1/2 pounds each. Doubled the marinade; marinated overnight and cooked in oven about 20 minutes then finished off for 2 minutes under broiler. Came out perfect – everyone loved it! Thank you, Amanda. Your recipes have not steered me wrong yet! Excellent and definitely a keeper! I love the flavor maybe a little over powered with ginger my tenderloin was 5 lbs so I added extra everything hals of half. Cook time I prefer well done a little pink but still very tender. I marinated for 4 hours turning often. Will fox again with adjustments. Served with fried cabbage and creamed corn. I just posted a review which I don’t yet see. It was outstanding (both the review and the pork). I wanted to add that I marinated overnight and did not separate the marinade into two parts. Then I took the reserved marinade and boiled/simmered for a topping sauce to pour over the pork. 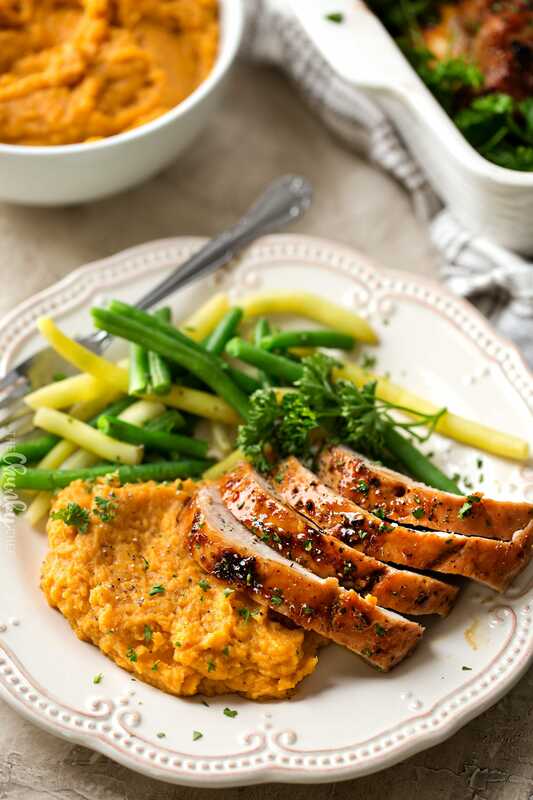 We love pork tenderloin and have several great recipes. This one was outstanding and will be added to our rotation. I added 2 tsp brown sugar and a little fresh rosemary, cooked it in a cast-iron skillet. We like our pork a bit rarer than most so I took it out of the oven at 130 degrees. After a quick broil, it came out perfectly pink for us. Served with mashed sweet potatoes and steamed vegetables. I marinated the meat overnight and it really paid off! It was packed with flavor! I highly recommend this, will make it again! Scummy. Finally a meal we can all meat. I am so used to having this kind of thing with rice, was really good with creamy mash and green veg. Yum can’t wait to make again! I have a 5 lb pork loin ,how long to cook it. Hi Keli, I’ve never made this using a pork loin, only the tenderloin which is a much different cut of meat. For a loin, I would bake at 400 F degrees for 10 minutes, then lower the heat to 350 F degrees and bake for 20 minutes per pound (so for 5 lbs it would be 1 hour 40 minutes), until the pork registers 145 F degrees with an internal thermometer. Let pork rest about 10 minutes before slicing. You may have to cover it with foil loosely at some point during the baking time, as I’ve never baked this sauce for that long before and it may get too brown. Thank you Amanda for info, I cooked it for 1 hour 10 mins and it was ready, turned out very good. Yes, a great recipe, but the marinade does take a while to prepare. Wow! I can’t believe that this can be prepared in 30 minutes. This is what I need in my life. Good food and fast for busy people like me. Thank you for sharing this. This is going to part of our family’s favorite. I think I have never made a pork tenderloin dinner so thanks for the inspiration! I don’t think a pork recipe can look much better than this! It looks so good and juicy! I don’t think I’ve ever seen a pork tenderloin look so good! As a matter of fact, YES! I have been in a rut – ugh. This tenderloin looks absolutely scrumptious, and easy to make, too. Can’t wait to try it. I needed this inspiration! Let’s be real, I cannot wait for fall and the holidays and all the delicious comfort food. This looks SO good- definitely kicking off oven season with this baby! This pork looks so mouth watering! 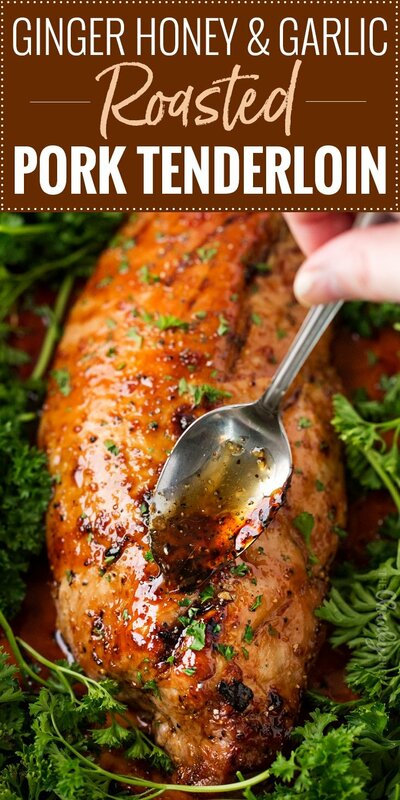 We love pork in our household and this would be perfect to try this fall! This is a gorgeous roasted pork dinner…my kids would love it too. 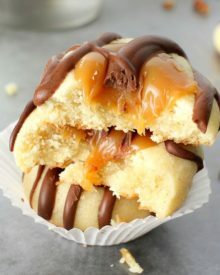 I’m drooling just looking at this! Pork tenderloin is one of my favorites. The color and the flavors you’ve used here look like real winners! This looks so fantastic! The flavor are amazing.